Russell Hose Ends - Full Flow Specialty Swivel UNIVERSAL - Dezod Motorsports Inc - Home of the automotive performance enthusiast since 2002. Russell’s Hose Ends are the perfect answer for connecting your oil and fuel lines without the need for a separate adapter. Each hose end attaches to the hose and threads directly into the fuel pump, fuel filter, Y-block or oil pump, eliminating the secondary AN adapter fitting. Available in traditional red and blue anodize finishes. Full Flow Swivel Radius Port hose ends allow you to plumb regulators, fuel pumps and dry sump with a minimum of fittings and connections. Designed for use with straight port threads, these ends eliminate the secondary adapter previously required. The hose ends attaché directly to the component utilizing an o-ring for a positive seal. The radius end and thread length desing allow full engagement with out blocking the port for unrestricted flow. Available in 45° and 90° for flexibility in your routing, complete with Viton™ o-ring. 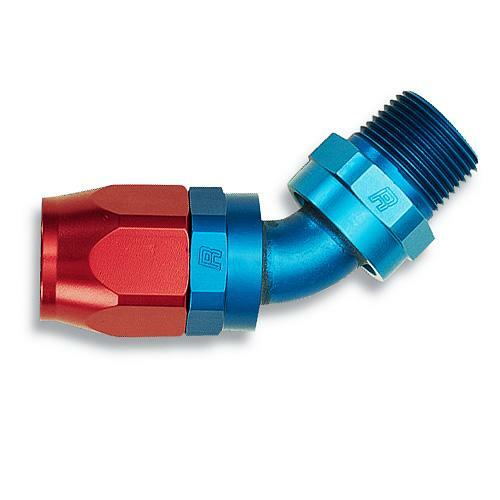 These hose ends are made of high-quality forged aluminum for superior strength and durability. With a unique tight configuration, our hose ends work perfectly in close engine compartments. The forged elbow design provides extra strength along with 360° full swivel adjustment.